Everybody loves Hitchcock, just as they should. No other director was as good at manipulating the audience into feeling whatever he wanted them to feel. Filmmakers are still learning from him, and probably always will be. Hitchcock's well-known moniker, the "Master of Suspense,” is accurate. Hitchcock was absolutely brilliant at telling his stories in such a way as to highlight the disparities of knowledge at the root of every kind of suspense. That is, situations in which we, the audience, are given a piece of information that one or more characters do not know. Hitchcock exploits these relative degrees of knowledge — known as a narration’s range — for the purpose of creating suspense. He was very, very good at it. One of my favorite examples of Hitchcock exploiting a disparity between two levels of knowledge occurs in Marnie, possibly my favorite Hitchcock film. The situation is that the title character, a pathological thief, hides in the bathroom at her office and waits for everyone else to leave. When she’s alone, she breaks into the company safe (she’s learned the combination earlier), steals thousands of dollars and skips town. She gets as far as opening the safe and grabbing the money when Hitchcock starts messing with the narration’s range. 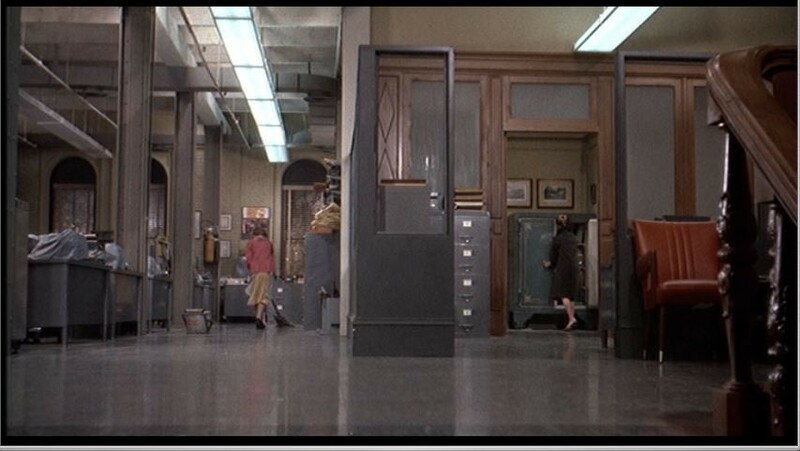 In one remarkable shot (below), Hitchcock shows us Marnie on the right, grabbing bundles of bills; and a cleaning woman on the left, who has emerged from some unseen room unbeknownst to Marnie. The two women are on opposite sides of a wall and cannot see each other. The cleaning woman is mopping the floor quietly; since Marnie makes no indication that she hears the other woman, we understand that she is not aware of her presence. And there’s the disparity: We know something that Marnie does not. This is the fact that creates the suspense. It’s not that we necessarily want Marnie to get away with her heist; indeed, we know that being caught might be the kick in the pants she needs to start addressing her kleptomania. The deliciousness of the scene hinges on Hitchcock’s brilliant visual depiction of the disparity in the narration’s range: On one side of the screen is the threat; on the other is the threatened. We sit in the only possible position in which this information can be learned at a glance. The kicker is that, just in time, Marnie notices the cleaning woman, who has not yet detected her presence. Marnie removes her clacking high-heeled shoes and stows them in the pockets of her coat as she tiptoes out of the building, attempting to avoid the cleaning woman. But then, as Hitchcock shows us in repeated cutaways, one of the shoes gets dislodged from her pocket and clatters to the ground. Marnie stands stock-still and gasps; chances are good that the audience does the same. In a typically Hitchcockian undercutting of the tension he worked so carefully to build, the cleaning woman … does nothing. She’s almost completely deaf, we soon learn. All that suspense and tension was for naught. And that’s what makes Hitchcock such a fiendishly good manipulator of audience emotions. The trick that Hitchcock pulls on us is the type that’s easy to ignore for being right in front of our faces. Stage Fright begins with Johnny (Richard Todd) recounting to Eve (Jane Wyman) the circumstances that led him to ask for her in fleeing from the police, who believe he committed a murder. Hitchcock presents the following information to us in a 15-minute-long flashback. Johnny tells Eve that his lover, Charlotte Inwood (Marlene Dietrich), had killed her husband and come to seek Johnny’s help. Like a fool, Johnny says to Eve, he went to Charlotte’s home to clean up the scene, but there he was spied by Nellie, the housekeeper. He’d gone back to his home to pack a bag before leaving town, but the police showed up at the door. Nellie must have recognized him, put two and two together, and called the police. Johnny managed to slip away from the cops and make his way to the theater where Eve was rehearsing for her upcoming play. That’s what has brought him to be in Eve’s passenger seat as she drives out of London to her father’s seaside shack, where Johnny will hole up for a while. All the information in the flashback is a lie, save for the fact that Charlotte’s husband is dead. He’s dead, all right, because Johnny killed him at Charlotte’s request. Johnny is in love with Charlotte, but she was merely using him so she could escape her husband and run off with her real lover, Freddie. Johnny concocted the elaborate lie to gain Eve’s sympathy and assistance. Throughout the film, Eve is under the misapprehension that the story Johnny told her was true. And so are we, because we know no more or less about Johnny than she does. Only at the film’s end, just before Johnny is about to strangle her, do both we and Eve learn the truth. When reality finally dawns on her, Eve, in a deft bit of acting (Wyman’s character is an actress, after all), turns the tables by lying to Johnny. She tells him she’ll help him escape, and that they should leave quietly through a side door. But she sends him through first, calls to the police who are scouring the theater they’re in, and quickly bolts the door. Seconds later, Johnny is done in when the theater’s iron safety curtain drops down on him from the flyspace. 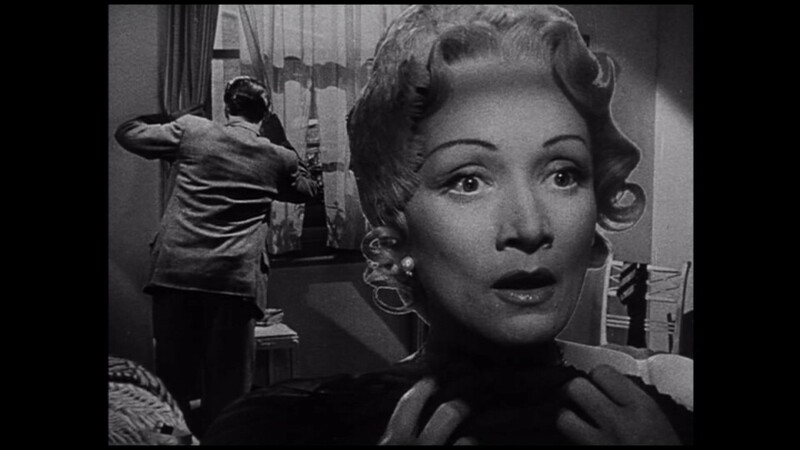 In lying to us with the opening flashback in Stage Fright, Hitchcock pulls off what might be the single most sustained act of suspense in all of cinema. From the end of the flashback to the moment of Johnny’s death, about 90 minutes elapse. During that time, we ardently follow and root for Eve as she goes to great lengths to get Johnny off the hook, never realizing that Eve herself is in danger of becoming his next victim. Some viewers at the time of the film’s release were reportedly outraged by the deception, and it’s easy to see why. We’re not used to films lying to us. But take a step back and it’s just as easy to see and marvel at Hitchcock’s remarkable skill in audience manipulation. Consider the effects of the range of the narration in the next film you see, and observe how it creates effects like suspense and surprise. I’m not saying this will make you the next Hitchcock, but it might afford some insight into the ways that filmmakers can use storytelling to cue our emotional responses.